Here we go again! If I’ve written once about printed pens, I’ve written a dozen times about them! Or is that the case? You see, as a promotional product, pens are so numerous and diverse, and by extension, no two blog articles could ever be the same. 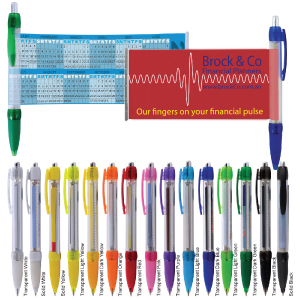 No two recipient offices could be the same – one of our clients chose a banner printed pen (the body of the pen contains a furled banner on which is printed all your important messages) and delivered it to two sets of his customers. This entry was posted in business gifts, Desk and Office, Giveaways, promotional pens, Promotional Products and tagged branding, conferences, events, giveaways, office, writing by admin. Bookmark the permalink.